Out now on vinyl and digital - lnk.to/PLAY025 The tireless and titanic dance figure that is DJ T. is next up on Seth Troxler’s essential Play It Say It label. 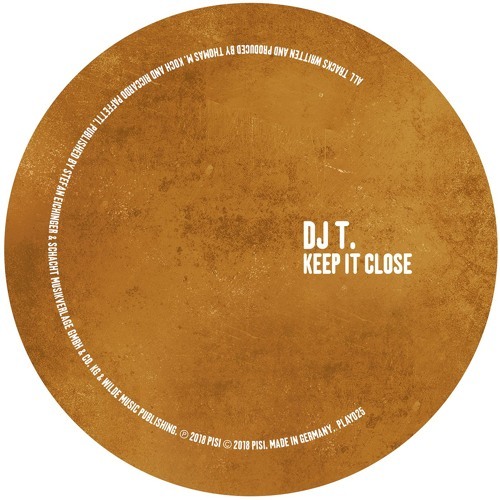 DJ T. has done it all in his long and storied career, from setting up one of the most influential labels in Get Physical to founding Groove Magazine via opening the Monza Club and, of course, serving up always inventive EPs and LPs on the best labels of the day. His sound has evolved through many house, disco and tech styles and has kept him an in-demand DJ for more than 25 years. These new missives are yet more proof that few know how to work the floor as well as DJ T.. The perfectly menacing ‘Keep It Close’ kicks things off with a dark, snaking bassline underpinning freaky synth stabs. The pressure builds throughout and will have the crowd locked in before it pulls back and builds again with a masterful grasp of mood. Hitting much harder is the excellent ‘The Day It All Started’, a more physical house track with solid kicks is designed for maximum impact in the club. Tumbling bass and gurgling synth riffs flesh this one out and ensure it is a real piece of dynamite. Last of all is the retro-tinged ‘1988’, with its tightly programmed drums, slick claps and spraying acid line. It’s a wild track to get the freaks out of the shadows and on to the ‘floor. This is a fresh EP that offers three very different but equally effective club tracks that are sure to blow up in the coming months.